MR. DISSOLVED PUTTY - RESANADOR LIQUIDO - Introducing a highly effective liquid sealant putty with even better viscosity than SURFACER 500.This product makes sealing up sections incredibly easy. Use SURFACER 500 for surface work and the liquid putty to even up rough sections. MR. 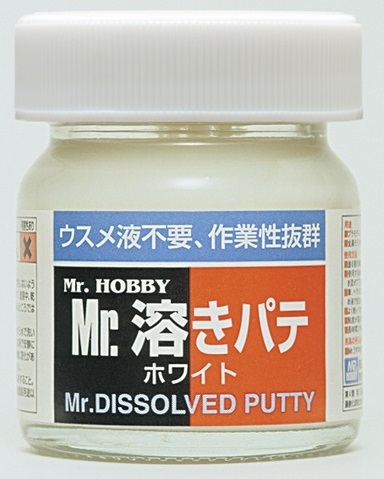 DISSOLVED PUTTY ES UNA PASTA RESANADORA LIQUIDA O SELLADOR ALTAMENTE EFECTIVO. ELIMINA LAS RANURAS FACILMENTE Y DESAPARECE LA UNION ENTRE LAS PIEZAS. CONTENIDO 40 g.